Ron is a real person. A Ronulian is someone who acts like Ron. A Ronduh puts up with him. Happy Ronday! Jeff and I met in college. We were in the same performance group, and often got paired together on stage – so we struck up a camaraderie that went from a light-hearted friendship to an off-and-on dating relationship. No commitments, we just accompanied each other to some on-campus events and had occasional meals together at the campus dining common. I took a job in town after my junior year, and Jeff went to Nova Scotia for the summer. When Jeff returned for his senior year, he met some of my summertime friends, including someone I had gone on a few dates with. Strangely, each meeting the other brought out their competitive nature, and the two of them were suddenly asking me on dates every weekend. It was slightly flattering, until you realized it was just one-upmanship vs. actual ardor. This went on for several months until I decided to move back home to help out my mother. I talked to Jeff occasionally on the phone, and we would sometimes write, but we both moved on with our lives and returned to our friendship status. Then, almost 7 months after I had moved away, Jeff called and announced he was coming to visit me. He was making a road trip with 2 other stops on the way, and would be at my house in a week. I hung up the phone and went down to tell my mother. “Why is he coming?” my mother asked. “I have no idea,” I admitted. When Jeff arrived, there were hugs and smiles. We chatted about our lives and I introduced him to my mother. He told me about his trip so far, and the people he had stopped to visit along the way: a girl from college whom he had dated off-and-on but had broken his heart, and another girl he had met through the first girl, and with whom he had started a long distance friendship. And now he was here. My mom and I looked wordlessly at each other across the table, and then went back to eating our meal. The three of us played a few board games after dinner before calling it a night. I thanked Jeff for including me as one of his “three top choices” but informed him kindly that I was disqualifying myself because I just didn’t care for him that way. Girls, can you believe I let him get away? Ron is real and the inspiration for the Rondays. A Ronulian is someone who is Ronlike. Happy Ronday! My intern was going back to college the last week in August, and my new assistant wasn’t starting until the 2nd week of September. So I had a one-week gap where I wouldn’t have extra help, and it was during the launch one of our bigger marketing campaigns. So I asked HR to provide me with a temp. Wally had just finished up an assignment in another department. I had him for 3 weeks to overlap the intern /new assistant. On Wally’s first day, I explained that we had a 3-piece mailer that had to get distributed internally to 500 employees. I was going to be in and out of meetings all day, but the intern understood the project and could answer any questions Wally had. Each part was coming from different places and at different times, and it would be his job to make sure to make/grab 500 copies of each and put them in the pre-labeled interoffice envelopes. I knew it was confusing, but as I explained, Michael the intern understood the entire project and could answer any questions. I came out of the meeting to find 500 copies of the memo all made, but no logo. It was clearly not on letterhead. “The logo is on the memo,” he insisted. I double-checked then looked curiously at Wally. Maybe it was like the emperor’s new clothes, because I didn’t see diddley or squat of a logo. Michael (my angelic intern) swept in and handled it while I rushed off to the next meeting. As I left meeting #2, I saw that the newspaper ad had been faxed over. Michael swooped in again to make sure the fax was copied correctly and I went off to my 3rd meeting. Then it was lunchtime. My whole department liked to eat together – and we invited Wally along. He was finishing up a few things, but he’d been working at our location for a while, so I assumed he would just catch up with us in the downstairs cafeteria. We headed down the hall when I heard this panicked cry of my name. I turned to see Wally running at us. Expecting to find out that we’d hit an iceberg or something, it became obvious that he just didn’t want us to leave him behind. Wally went back to eating and so did we, trying to cautiously sneak glances at him for signs of alien matter when he wasn’t looking. On our way back to the department, I decided to check in the mailroom to see if the sample postcards had arrived from the printer yet. I decided to shake it off and head on to the mail room. I mean, really, how bad could it be? And hurray! The postcards had arrived for the 3-piece mailer! I grabbed a few samples and headed back to my department. Wally nodded his head slowly, and then waited for Michael to return from the bathroom so they could head down. I went in to my office to check emails and faxes for a few minutes. I heard a knock at my door and turned around to see Wally standing in the doorway. That was Wally’s first and last day working for me. Ron is real. That fact alone should scare you. Happy Ronday! As you may recall, Ron and my sister had bought Garth Brooks tickets using the money from when his car payment had bounced. That was the final straw for me as far as helping my sister out financially. I would buy her groceries, I would give her rides, I would help her look for jobs and apartments and help in other ways. But I just wasn’t going to give her any more money, even as short-term loans. My father and stepmom felt the same way and felt like it was time they learned a little truth and consequence. So when they got the inevitable call from my sister that she and Ron were broke again and they really needed money, my father proposed a plan. My father would buy the concert tickets from them, enabling them to get the money they so “desperately” needed. Of course, this was not fair to either Ron or my sister. Give up concert tickets so they could have food and gas? Eschew luxury for practicality? Heresy! But after a few days, they took the offer and the exchange was made. Now, my father & step mom had no interest in seeing Garth Brooks in concert –but now they had tickets to go see him. They couldn’t give the tickets back to my sister, because they would not be proving their point. So one day, my father hands me the tickets. My husband at the time and I lived in the town where the concert was being given, and liked a few of his songs well enough. What was I to do? We went to the concert, never saying a word of it to my sister. The man put on a great show, even from our nosebleed seats. A few weeks later, Ron and Sis came to dinner. Ron being Ron, he thought nothing of poking about our bookshelf and found the concert program. “Wow – those sound like great seats.” And nothing like the seats we sat in. “Yeah, well, your dad and mum really wanted them so we gave them the tickets instead. If you only knew, Ron, if you only knew. Here’s another post I found on my old OKCupid journal that I thought you might like to see. I had an eHarmony profile back in those days – and I’m not sure if the process has changed or not – but back then you had to choose a reason whenever you wanted to delete a match from your account. This was originally written in December 2007. I have been having fun on eHarmony today. Well, not really “fun” but going through and closing out all the recent matches they have sent me.”Closing” a match means that you are no longer interested in the candidate. eHarmony doesn’t allow you to close the match without selecting a reason – here are your options and my interpretation of the actual reason one might pick. I think our family backgrounds are too different. You are redneck, and I am above the likes of you.I have too much happening in my life at the moment. You look like drama. I already have drama. Thank you, please move on. I don’t feel that the chemistry is there. There are not enough drugs in the world that would make you look good to me. You are way too demanding. I think the physical distance between us is too great. I want to pursue other matches at eHarmony. There’s got to be SOMEBODY better than you out there for me. I am pursuing another relationship. Totally legit answer – but it can sometimes make you feel like – I found somebody else, you missed your chance with me, too late! and I found someone – you never will. I’m just not ready for the next step. You live too close for the “physical distance” answer – but I just can’t stand the thought of being with you. I am taking a break from dating. Thanks, I’ll pass on dating YOU – my break will be over when someone hot comes along. Mom says, if you can’t say anything nice . . . This match never responded to my request to communicate. I reached out to you, you ignored me, and now I’m telling! I think the difference in age between us is too great. Go hit on someone from the nursing home, grandpa! Like I have some, and you don’t . . .
Based on statements in their profile, I’m not interested in this match. Their profile contains the babblings of a psycho alien or unibomber. Because there are no photos posted/I couldn’t see any photos. Cause you could be ugly, and I don’t date ugly. Because I was put on Hold. Think you can put me on the backburner so you’ll have a fallback when Miss America dumps you? Homey don’t think so. I’ve got his digits, I don’t want him holding up my chances for someone else . . . There is something so wrong with you, I can’t even put it in to words. I was going through some old journal entries on my OKCupid profile, and came across this poem I had written back in 2007. This would have been a few months after having broken up from a second, long-distance attempt with Sully. I was also living with my mom after escaping from crazy psycho roommate and feeling like that cliche – 30-something divorced chick living with mom and trying to put the pieces back together. I promise the tears are only matters of time. My heart and my soul can’t find what they’re seeking. And yet in my sorrow I’m starting to rhyme. I can’t tell my mother, she’s in her room sleeping. The friends I call out to don’t answer their phone. I sit at my desk and I ponder my options. And yet all I know is that I shouldn’t be alone. When all that I want is to curl up in bed. I wish it would stop or I knew what to do. The sorrow I feel is all in my brain. Others can do it, but what is my deal? To take the insanity and cause it to die. But nothing I do can catch them so fast. Knowing I’m only now giving the cue. Will someone save me? Is there a knight present? What good it would do me, I haven’t a clue. Don’t run away, but please don’t come too near. Whatever odd kindness you muster for me. I hope that time will soon set me free. Being dumped hurts. Being dumped a few minutes before your prom is just devastating. 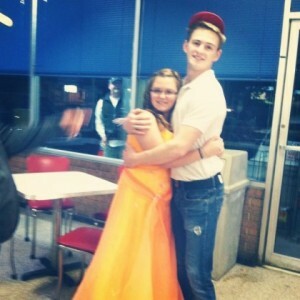 But sometimes, when you dejectedly go to the local hamburger joint in your prom dress, a boy named Bryan happens. I first heard this story this morning on the radio as I drove back to my office. Bryan Hayes is a server at Jim’s Hamburgers & Hotdogs near Greensboro, NC. He heard about the 15-year old being dumped before her prom, and came out from behind the counter and asked her to dance. At first there was no music, than a customer appeared with their iPod and “Kiss Me” by Faith Hill was playing. This doesn’t have to be a love story, although I’m sure some moviemaker will try to make it in to one. All that matters is that this boy, at 17, understood that sometimes, even when you can’t fix everything, you can still ask the girl to dance. I know I had mentioned having someone new and special in my life, but that was fairly short-lived. In reality, I think of him now as my shock absorber. He was newly in my life when I found out about my ex’s engagement, and his presence certainly cushioned the blow. In hindsight (which is always 20/20) – there were definitely some red flags (maybe pink flags? Orange flags? Flags of a different color?) which I saw but thought I could decide on later. Maybe I was just tired of searching. Whatever the case, he left my life as suddenly as he came in, just like the tide I talked about. And that’s just fine. Rocker said this to me as we were driving to lunch one day. I didn’t point out to him that we had, in fact, met online. It didn’t seem appropriate somehow. Radio had a different idea. He’s now in a relationship with a girl he met on OKCupid. I read through my online profiles again, and thought about revamping them – but I feel like they still hold true and so I just left them as they were. I still proactively message someone if I’m interested, but nothing major has occurred. So, I’ve decided to go a bit organic for a while. This is hard for me. I was never much for waiting around for a guy to ask me out. I’m still not. But the con season is fast approaching, and it is really the first con season I’ve been through where I’m single vs. attending solo but being in a relationship. So we’ll see what happens. Go all zen and stuff. “Don’t be so laid back that people don’t think you are interested,” Radio warned me. Aargh. That’s my quandary. I can either shut off my brain and say, “I’m not looking at all” which institutes the Whoosh Factor that I’ve already discussed. If someone hits on me when I’m in that mode – I just don’t see it. Or, I can become the huntress on the prowl and seek out my prey like an Amazon on a mission. Cause that’s not intimidating. Nope not at all. Plus, it tends to attract guys who like to be pursued and dominated, which isn’t really what I’m looking for either. So how does one go organic and still show that you are available and interested? I have no clue. But I’ll try to figure it out and get back to you.